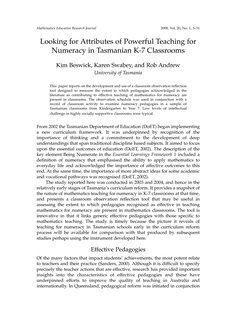 This paper reports on the development and use of a classroom observation reflection tool designed to measure the extent to which pedagogies acknowledged in the literature as contributing to effective teaching of mathematics for numeracy are present in classrooms. The observation schedule was used in conjunction with a record of classroom activity to examine numeracy pedagogies in a sample of Tasmanian classrooms from Kindergarten to Year 7. Low levels of intellectual challenge in highly socially supportive classrooms were typical.